At Mud Bay, a pet-supply chain in the Pacific Northwest, district manager Catherine Knowles, left, says minimum wage increases have frustrated some tenured employees. (by Rachel Feintzeig and Lauren Weber, The Wall Street Journal) – The growing push to raise the minimum wage to as much as $15 an hour is creating new issues in the workplace: While some of America’s lowest-paid workers will get bigger paychecks, their veteran co-workers may feel underpaid. So-called wage compression poses a financial and management challenge for employers, who say wage increases have rankled some staff unhappy that less experienced co-workers now earn the same wages they spent months or years striving to achieve. At Gap Inc. and Wal-Mart Stores, which recently increased wages, store managers have had to address employee questions about fairness and pay. Some companies have raised pay for veteran workers, and others plan to offer extra fringe benefits, fearing that valuable workers might otherwise jump ship. 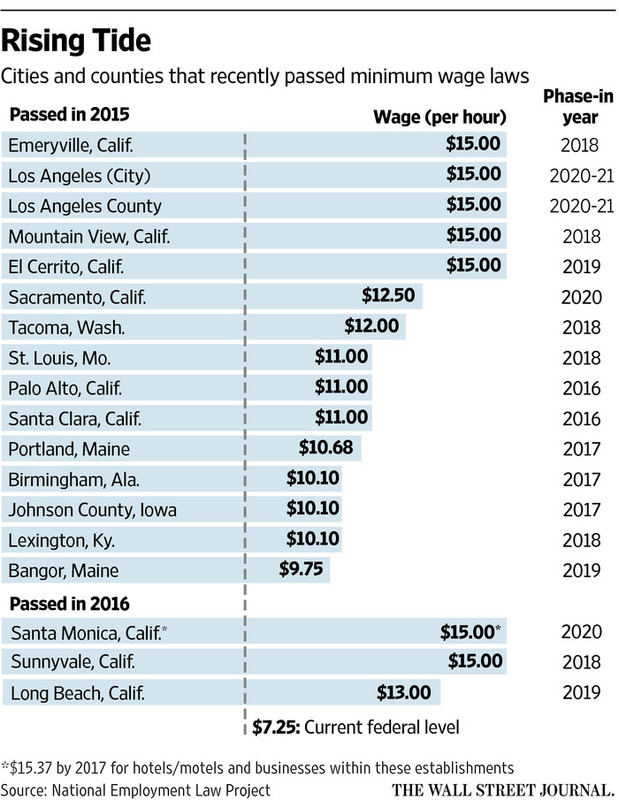 Dozens of cities have passed wage increases in the past four years, and New York and California recently approved increases to $15 an hour. Cities considering similar measures include Flagstaff, Ariz.; Minneapolis; Washington, D.C.; Olympia, Wash. and others. The Supreme Court’s decision [last week] not to take on a challenge to Seattle’s minimum-wage rule removed one of the most significant legal tests of local wage laws. 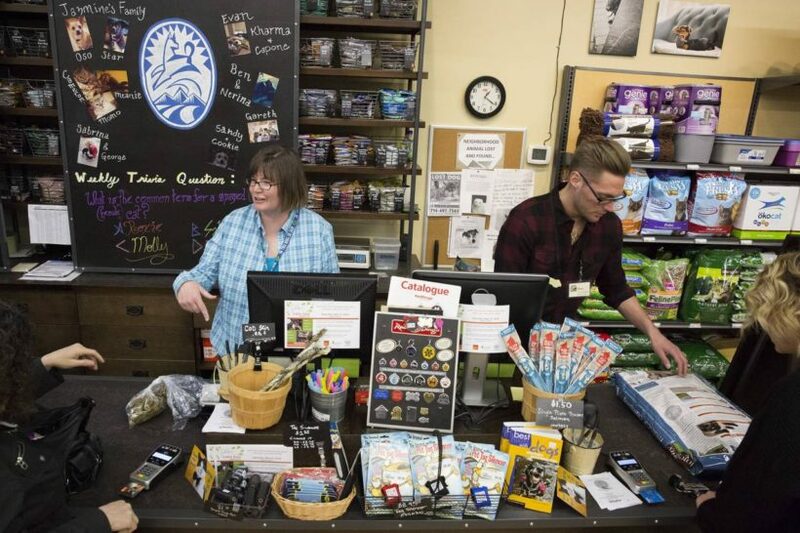 “As you’re raising that bottom, it’s affecting everybody,” said Catherine Knowles, a district manager overseeing eight Mud Bay Inc. pet-supply stores in Washington state. In Seattle, where city laws require many large employers to phase in a $15 minimum wage by 2017, Mud Bay store employees now earn at least $12 an hour, with 50-cent hourly pay hikes planned for September and January 2017. Employees who had spent a year or two on the job before reaching the $12 hourly wage told managers that it felt unfair that newcomers were paid the same amount, Ms. Knowles said. “They felt that they weren’t able to get compensated for what they learned,” she said. Managers showed the workers copies of the company’s pay scales and explained that, while the company was raising the minimum wage, it couldn’t give everyone raises. Gap won accolades in February 2014 for announcing it was raising pay to a minimum $10 for its more than 60,000 hourly employees the following year. The retailer has recorded a double-digit increase in job applicants since then, according to spokeswoman Laura Wilkinson, as well as increased employee retention. A current Chicago-area Gap sales associate said the wage hikes prompted her to look for other work. She joined the company in 2013, earning $9.25 an hour, won a small raise in 2014 and had hoped to reach $11 by 2015. Instead, she was given $10 an hour last June, just like new employees, though she had been with the retailer for two years. Gap’s leaders considered wage-compression issues before putting the change into place, and raised some employees’ pay above $10 as a result, according to a company spokeswoman. She declined to comment on the employee’s complaints. Last year, Laura Jankowski raised pay for entry-level employees at her three Tropical Smoothie Café franchise locations on Long Island to comply with New York laws raising minimum pay for fast-food chains. New hires now earn $9.75 an hour—the same wage that the café’s shift leaders had been earning. Among the shift leaders who got a raise at Ms. Jankowski’s Port Jefferson, N.Y., store was Danny Zambito. The 18-year-old high-school senior said he’d likely consider leaving a job that paid shift leaders the same as other workers. When Virginia legislators considered proposals to raise the state minimum wage earlier this year, Lori Janke, owner of three clothing resale stores there, computed how an increase from $7.25 to $10.10 per hour would affect her 60-odd employees. Had the proposals passed, she projected the higher wages would have eaten up a fifth of her 10% profit margin; preserving the current wage scale, with veteran workers earning more than newcomers, would have consumed more than half of profits. To offset those costs, Ms. Janke said she would have to cut out the role of either shift leaders or assistant managers and train all employees to handle every role, a change that would require more stringent screening of new hires. The proposals were all defeated in committee in the Virginia assembly. People derive more happiness from pay when they know they’re earning more than co-workers, research shows. … “One lesson we learned early on is people talk a lot about how they’re compensated,” said Mark Wittman, co-founder of Farm Hill, a prepared-food delivery service in Redwood City, Calif. Pay for Farm Hill’s 100 hourly workers starts around $12.50 an hour, with longer-serving employees earning as much as $16 in the same roles. Mr. Wittman said he and managers will have to communicate very clearly with employees if the pay divide narrows between more and less-skilled workers. He may also reward long-serving workers with extra benefits, such as time off or discretion over scheduling. “You have to either maintain the gap or make up for it in some other way,” he said. Published at WSJ .com on May 5. Copyright 2016 Dow Jones & Company, Inc. All Rights Reserved. Reprinted here for educational purposes only. May not be reproduced on other websites without permission from The Wall Street Journal. Visit the website at wsj .com. 1. Describe the problem some employees have with the government imposed mandatory minimum wage increase in several cities across the country. 2. a) How are large chain stores like the Gap and Walmart dealing with this problem? 3. a) Which states have passed laws requiring businesses to increase the minimum wage they pay employees to $15/hour? b) How many cities have done the same? 4. a) For what reasons do supporters of mandated minimum wage support these laws? b) For what reasons so those who oppose government mandated minimum wage do so? 5. a) What benefits did the Gap gain from raising minimum wage pay for its 60,000 hourly employees to $10 in 2015? b) Why did it cause at least one employee in a Chicago area gap to look for another job? c) Do you think this is a reasonable response? Explain your answer. 6. a) How did the owner of three Tropical Smoothie franchise locations address the issue of shift leaders salaries now being close to new hire regular employees? b) How did she make up the extra money paid to these workers? c) Do you think the price increases will hurt her business? Explain your answer. d) Do you think your answer would be different based on the amount of spending money you personally have to spend each week? Explain your answer. 7. a) Do you support local, state and federal government mandates that businesses pay their employees a certain minimum wage? Why or why not? -Do you think mandatory $15/hour minimum wage laws will hurt or harm the economy in the long run? -Do you think mandatory $15/hour minimum wage laws will hurt or harm teen employment numbers the long run? -What, if any, do you think the government should set the minimum wage at? Why? -Large corporations have shareholders (investors) they must answer to: do you think they will be able to significantly increase minimum wage without increasing their prices?